The distances to objects in the Universe can differ enormously. The nearest star to us—Proxima Centauri—lies some 4.2 light-years from us, while some incredibly distant galaxies are so far away—13 billion light-years or more—that they are only visible to us as a result of cosmic tricks of magnification. The subject of this image, a galaxy called ESO 376-16, sits nearly 23 million light-years from Earth—not that great a distance on a cosmic scale. However, given the galaxy’s relative proximity to us, we know surprisingly little about it. Astronomers are still debating about many of the properties of ESO 376-16, including its morphology. Galaxies are divided into types based on their visual appearance and characteristics; spiral galaxies, like the Milky Way, are flattened discs with curved arms sweeping out from a central nucleus, while irregular galaxies lack a distinct structure and look far more chaotic. 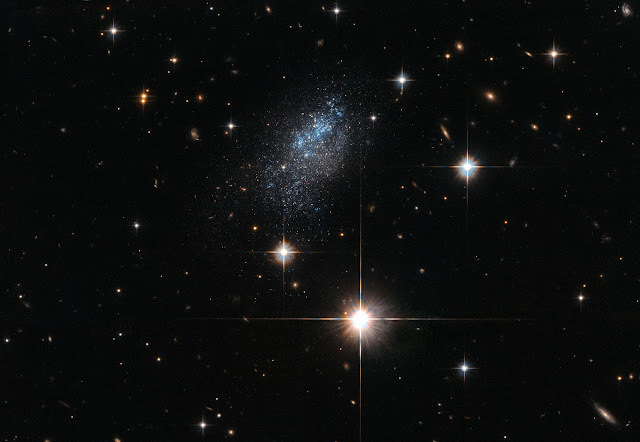 On the basis of its rather ill-defined morphology, ESO 376-16 is thought to be either a late-type spiral or a dwarf irregular galaxy. Despite its mystique, observations of ESO 376-16 have been useful in several studies, including one made with the NASA/ESA Hubble Space Telescope that aimed to create a 3D map of galaxies lying in the vicinity of Earth. Researchers used Hubble to gauge the distance to galaxies including ESO 376-16 by measuring the luminosities of especially bright red-giant-branch stars sitting within the galaxies. They then used their data to generate and calibrate 3D maps of the distribution of galaxies throughout the nearby cosmos.